89G. I bought this car in September 1990 from Crossways garage at Leeming Bar for �95. It was exactly a year old and was seriously underpriced. At that time, AX GTs were quite in demand, and it was difficult to find one apart from at a main Citroen dealer. They invariably charged top prices - typically over �00 for a comparable car, when they only cost �00 new. It had only done 7000 miles, and had had one owner. The Citroen was quite a good car. It only let me down once, when the clutch release arm bent (rubbish design). 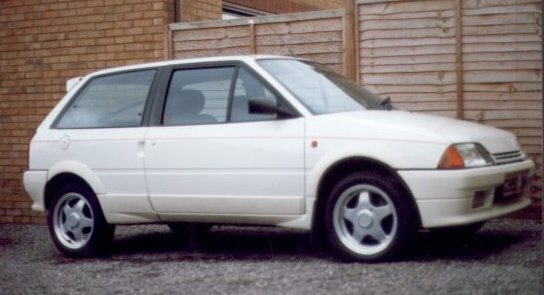 As with most French cars (see also the Peugeot 605), the quality of the alloy wheels was poor. I replaced the standard wheels with a set of different alloys from Elite Tyres. At the same time I changed to "soft" Firestone tyres from the original "hard" Michelins. This unfortunately messed up the car a bit, because it gave it too much grip for the suspension to handle. The car had a Waso remote control alarm, and I added a Sony CD-Tuner head unit and more speakers than I choose to remember. I kept this car for quite a long time. It had a full Citroen Service History and apart from a few niggles was a good fun car. In the end I sold it for �00 privately, with 45000 miles on the clock.